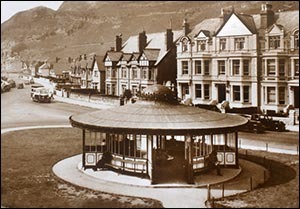 This unusual circular shelter was used for many years by people waiting for trams on the Llandudno & Colwyn Bay Electric Railway. The tram track was some distance away, on the far (southern) side of the grassed central reservation along Gloddaeth Avenue. The tram service began in 1907. For a few years, the journey to Colwyn Bay began at Dale Road, c.150 metres south of Gloddaeth Avenue. This track was soon abandoned, and for most of its existence the system’s western terminus was near the circular West Shore shelter. The system closed in 1956. The shelter was probably constructed in 1929. The land in this area had been given by the Anglican church to the Llandudno Improvement Commissioners in 1893 with a covenant that no “building or erection whatever” should ever appear on the land. In February 1929 the church commissioners gave written consent for the local council to erect on the land “a shelter for the protection of the public against wind and rain”. By 1929 public buses had become a major form of transport. Services from Llandudno used the roads encircling the shelter to turn around prior to their next journey. There is no mention of buses or trams in the church document, but the shelter’s shape and position – some distance from the sea – suggest that the council primarily had passengers in mind when it built the shelter. Today frequent buses from Rhyl via Llandudno circle the shelter before starting the return journey from the bus stop outside the shelter. In 2015 the White Rabbit statue of 1933 was relocated to the green outside the shelter.